Looking for a simple sure way to detox from heavy metals, mercury, vaccination or pesticide poisoning? How about an easy way to clear your body of fungus, bacteria, parasites, viruses and other pathogens? Miror EPF – SHIPS FREE! This product has been like a miracle for me and my family. It is called Miror EPF which means “wonder” and is not Mirror EPF. Just a few drops and we have been able to recover from colds and flus. It has also helped to keep me healthy as I continue to heal from having breast cancer. Many people that have had or have breast cancer wonder what toxins are in their body. For me and many breast cancer patients it is pesticide poisoning that for some reason like to settle in breast tissue. For others it is heavy metal, mercury or vaccination poisonings that are weakening their immune system. This product would help with all of that in a very short time. I know this because I have had personal experiences with pesticide poisoning from GMO foods. I am tested monthly with Spectravision Bodyscan equipment and can see firsthand how the EPF product works. My results have improved dramatically since taking this product. I recently tested it as I was taking the recommended detox dosages (3 drops, 3 times daily) for weeks when I struggled with radiation poisoning (one thing I found that this product does NOT help with!). My Bodyscan results were clear (for the first time ever) of all viruses, bacteria, fungus and parasites. The only thing that came up was the radiation! Prior to this experience I was only taking the product when I wasn’t feeling 100% and only took it until I felt well again (usually didn’t take very long). HOW EPF KEEPS ME HEALTHY! I had been using the Spectravision Bodyscan for 3 years as my way of keeping my body healthy and cancer free. I would go back every few months for a checkup. Each time there would be some fungus, strange parasite, bacteria or virus that would pop up from eating out or being exposed to various pollutants. Well I stopped going regularly after discovering what EPF could do. I was feeling great but wanted to be sure I was doing well so I went for another Bodyscan after waiting 18 months and not my usual 2 months. I was still nervous for my checkup considering my breast cancer history and was bracing myself for the worst. Since taking EPF regularly my scan was CLEAN! After a year and a half of maintaining my own health that was amazing! My nutritionist was shocked. She said she has never had anyone come in for a checkup and be completely balanced. I do take care of myself, but I am far from perfect. I owe EPF for keeping me healthy and saving me a LOT of money on checkups, extra supplements and herbal remedies! Thank you miracle product…I mean Miror Core Product! MirorCore products recognize the good cells in and on our bodies and begin working to regenerate and rejuvenate them while breaking down and destroying the debris of every bad cell they come into contact with. Mirorcore products can detoxify, rebuild, and restore cells back to their original condition while preventing future diseases. It can be used safely externally and internally. This small dropper bottle is the first phase to better health in more ways than imaginable. Taken internally, an average of 3 drops in a few ounces of purified water or juice, 3 times each day (or as directed by your health care professional) will provide amazing results. 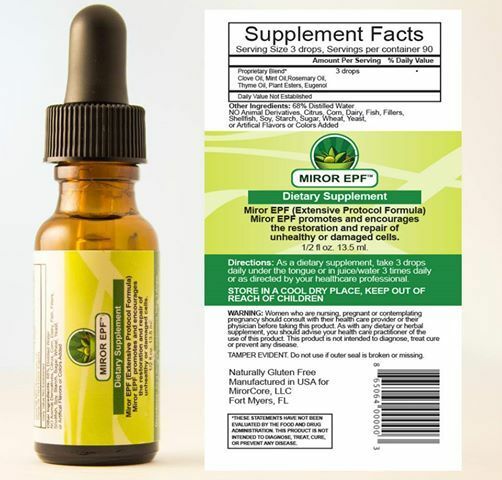 With antibiotic, antioxidant, antiviral and anti-fungal properties, Miror EPF™ assists the body in killing and removing pathogens*…a gentle detox action, helping to maintain and restore healthy cells throughout the body! After your initial cleanse I find that a good maintenance is 2 drops twice daily. With this amount I have been able to keep the pathogens away and maintain my health. I now only take more when I think I am fighting a virus and then I take 4 drops 3x a day for about 4 days. MIROR EPF™ is an extensive protocol formula discovery in biochemistry that promotes and encourages the restoration and repair of unhealthy or damaged cells. MIROR EPF™ uses a proprietary solution to blend certain plant oils and esters that could not be blended until now. MIROR EPF™ is a non-toxic, 100% plant-based liquid, no additives or preservatives…ever. MIROR EPF™ kills and instantly stops reproduction of bacteria, fungus and virus. MIROR EPF™ promotes healing and preserves tissue. MIROR EPF™ is unique (a remarkable scientific discovery). MIROR EPF™ does one thing very well….and that one thing has many significant applications. MIROR EPF™ is the only active ingredient that selectively attacks non-salt-based proteins – without harming salt-based proteins. This unique mechanism enables MIROR EPF™ to function as a powerful disinfectant and a healing agent – at the same time. Testing confirms that MIROR EPF™ is a LETHAL pathogen killer – that leaves no background debris. Take 3 to 4 drops in 4 ounces of purified water or juice 3 times daily. If you are not sure what is in your body but just want a general detox I would recommend taking 3 drops 3 times a day for a few months then use medicinally. You may want to start slowly as some have experienced typical detox symptoms (skin eruptions and changes in bowel movements and urination). If you would like to find out what is happening in your body I have found a few that have worked for me (please tell them Dolores sent you!). Find a nutrition center that uses Spectravision Bodyscan equipment like the one I go to in Langhorne, PA.
Do a phone consultation with Mike Carey who is able to read cellular memory. *Independent laboratory testing on Mirror EPF plant sourced, non toxic formula illustrates the effectiveness of Miror EPF at neutralizing many pathogens. If you have cancer the recommendation is 4 vials (droppers) full a day for 4 weeks. Obviously, no one can say they can cure cancer (even if they can) – but read what this product does and decide for yourself. In my opinion – it is worth a try. If you are doing this protocol – I am now offering a discount on the purchase of 2 of the 1 oz. bottles. Just report back your findings. Read the Science Overview on EPF. If you want to, could you check the link, & see if it needs fixing? Hey Sari, I will check the link although someone just bought the other day. To get the discounted price you have to buy a lot initially. So you will have to have a means of selling it to others. Could be worth it for you if you find it helpful and think others are interested. I sold a lot to friends and family. Let me check how much to send to CA. Maybe the link doesn’t work for you bc you are out of the country. Will let you know. Thanks for letting me know! Apparently only the 1 oz link was working…odd. I fixed it now. I appreciate you telling me! Sari, you should contact me about this old friend! Would this work for a sinus infection? if so do you take it internally? It would help address the root cause of the infection…bacteria or fungus or virus. Yes, you would take it internally. Estimate 3-5 drops 3 times daily for 5 days. For immediately relief put a garlic clove or tablet in your nostril for as long as you can stand it or until your nose starts to run. It will unclog your sinuses quickly. Let me know how it works for you. Can you please tell me if this is safe you use in pets? I’ve been recently diagnosed with mold exposure. My poodle mix has suffered with upper respitory issues for several months. Thank you. It is a plant based tincture. I would recommend one or two drops daily if it is a small dog. You can also call Mike Carey http://www.alternativesolutions4health.info – he can read pets. FYI- I just gave some EPF drops to my cat because she was eating the Purina Beyond food which I no longer trust. Dogs have died on their Beneful line from liver failure due to toxins in the food (apparently the food is made in China?). I looked up the Beyond and people are complaining about that line as well. My cat has always thrown up on the Beyond so I gave her a few drops of the EPF (actually only 1 for a tiny pet would be good) in her water. No more Purina foods for my pets no matter if they claim it is natural….trust is gone. Thank you so much for the information. I know what you mean about the trust being gone. Gets Blue Buffalo at night but I’m hoping its of good quality. Good luck with your kitty. Does the Miror EPF remove mercury from the body? Also, does it help with EBV or HHV viruses? I believe the answer to all three of your questions is YES. It removes heavy metals and works to kill pathogens – viruses and bacteria. It is a remarkable product that has kept my family healthy. More people need to know about it!!! Absolutely. I have been giving it to my son for various things since he was 3. I put a few drops in juice. You can also use topically. What is your experience using mirror for psoriasis, any results? I do not have experience with EPF and psoriasis. If it is caused by a fungus then it would help for sure. Does MirorEPF kill good flora/bacteria? That has not been my experience. I get tested often and my flora is always fine. Also the product is designed to kill pathogens only. It can, however, reduce the effectiveness of drugs. You are to take them separate. I’m just starting to use Miror EPF and am curious if there is a better time during the day to take my does than another? Can it be taken around food? The only thing that matters when taking the EPF is that you take it about 2hrs apart from medication.